The U.S. Navy commissioned the nation’s seventh Littoral Combat Ship (LCS) – USS Detroit (LCS-7) – on the Detroit River, officially placing the ship designed and constructed by a Lockheed Martin-led industry team into active service. USS Detroit (LCS-7), the fourth Freedom-variant in the LCS class, completed acceptance trials in July and was delivered to the U.S. Navy on August 12. It joins three other Freedom-variant ships in the fleet: USS Freedom (LCS-1), USS Fort Worth (LCS-3) and USS Milwaukee (LCS-5). Collectively, Freedom-variant ships have sailed over 225,000 nautical miles/258,925 miles/416,700 km and successfully completed two overseas deployments. 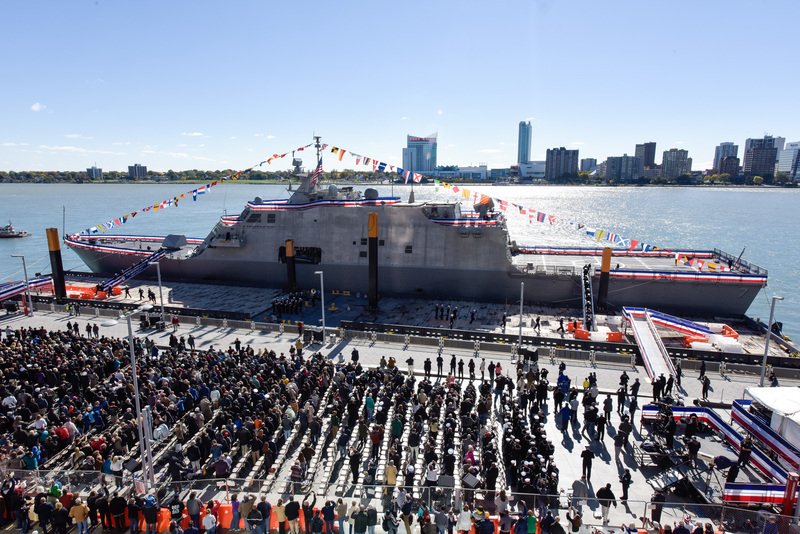 «The entire Lockheed Martin-led LCS team is honored to have delivered USS Detroit and witness the ship being commissioned and brought to life in her namesake city». said Joe North, vice president of Littoral Ships and Systems. «For decades to come, USS Detroit will serve in the defense of our great nation, enabling the U.S. Navy to carry out its missions around the world and representing our nation where and when needed». 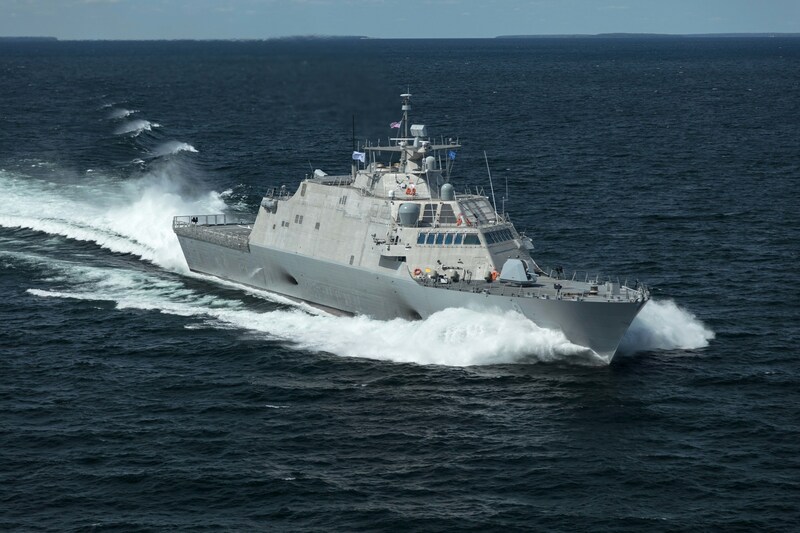 The Lockheed Martin-led industry team is currently in full-rate production of the Freedom-variant, with six ships under construction at Fincantieri Marinette Marine (FMM) and three more in long-lead material procurement. The ship’s modular design and affordable price enables the U.S. Navy to provide presence where and when needed at a fraction of the cost of other platforms. USS Detroit (LCS-7) is the sixth U.S. Navy ship named USS Detroit. Previous ships to bear the name included a Sacramento-class fast combat support ship, an Omaha-class light cruiser, a Montgomery-class cruiser and two 19th century sloops of war. The Lockheed Martin-led LCS team is comprised of shipbuilder Fincantieri Marinette Marine, naval architect Gibbs & Cox, and more than 500 suppliers in 37 states. The Freedom-variant’s steel monohull is based on a proven, survivable design recognized for its stability and reliability. With 40 percent reconfigurable shipboard space, the hull is ideally suited to accommodate additional lethality and survivability upgrades associated with the Freedom-variant Frigate. The Lockheed Martin-led industry team delivered the nation’s seventh Littoral Combat Ship (LCS), the future USS Detroit (LCS-7), to the U.S. Navy on August 12. The future USS Detroit (LCS-7) is the fourth Freedom-variant LCS delivered to the U.S. Navy by Lockheed Martin and is scheduled to be commissioned in Detroit on October 22. 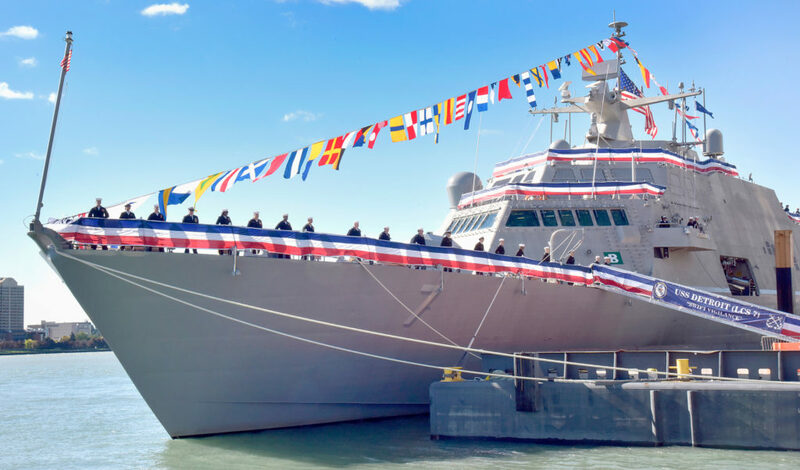 «Team Freedom is proud to deliver another capable LCS to the Navy», said Joe North, vice president and general manager of Littoral Ships and Systems. «Once commissioned, the USS Detroit will represent the interests of the United States where and when needed, with a level of force that will deter and defeat threats». 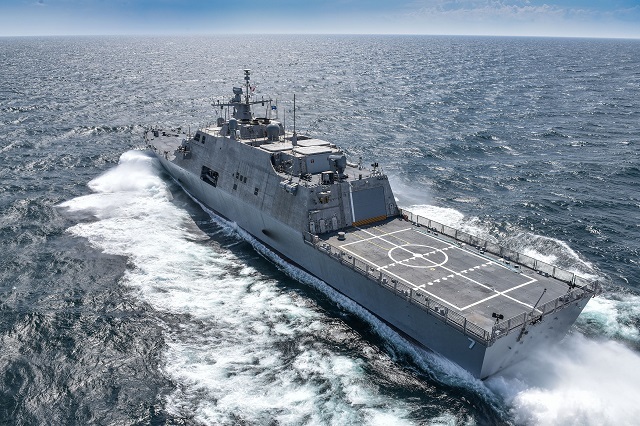 The Lockheed Martin-led industry team is currently in full-rate production of the Freedom-variant, with six ships under construction at Fincantieri Marinette Marine (FMM) and three more in long-lead material procurement. The ship’s modular design and plug-and-play architecture enables the U.S. Navy to achieve increased capacity and capability at a fraction of the cost of other platforms. «We are proud to deliver another proven warship that allows our Navy to carry out its missions around the world», said Jan Allman, FMM president and CEO. «We look forward to working with the U.S. Navy to continue building these highly capable ships for the fleet». LCS-7 will be the sixth U.S. Navy ship named USS Detroit. Previous ships to bear the name included a Sacramento-class fast combat support ship, an Omaha-class light cruiser, a Montgomery-class cruiser and two 19th century sloops of war. 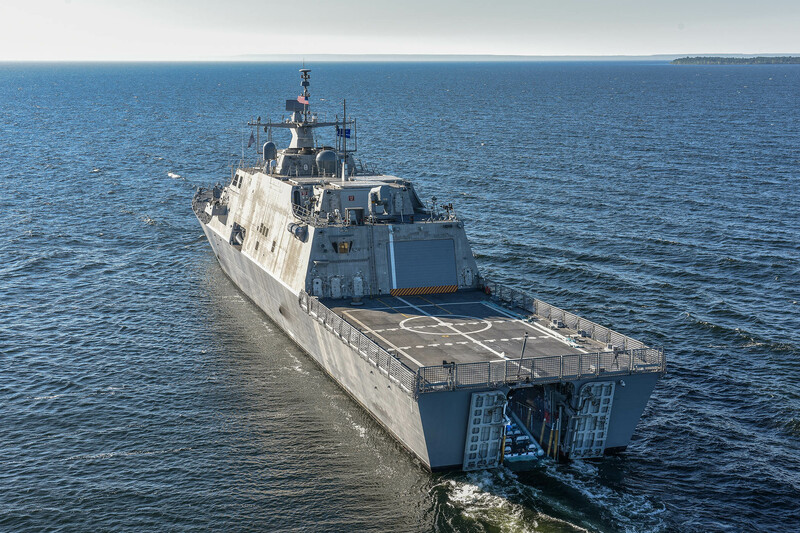 Future USS Detroit (LCS-7) successfully concluded its acceptance trial July 15 after completing a series of graded in-port and underway demonstrations for the U.S. Navy’s Board of Inspection and Survey (INSURV). The acceptance trial is the last significant milestone before delivery of the ship to the Navy, which is planned for this fall. 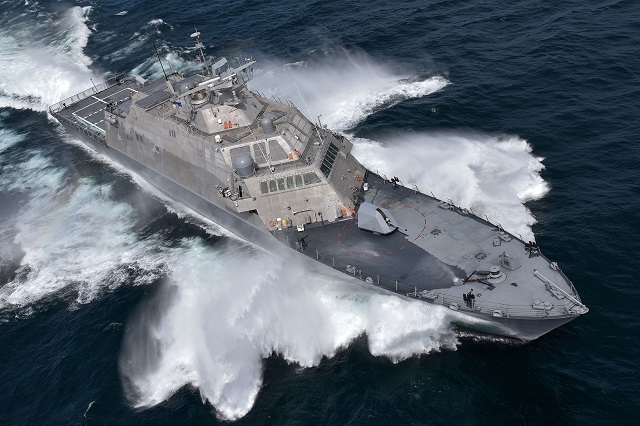 During the trial, the Navy conducted comprehensive tests of the Littoral Combat Ship (LCS) intended to demonstrate the performance of the propulsion plant, shiphandling and auxiliary systems. While underway, the ship successfully performed launch and recovery operations of the 36-foot/11-meter Rigid Hull Inflatable Boat (RHIB), conducted surface and air self-defense detect-to-engage exercises, and demonstrated the ship’s maneuverability. 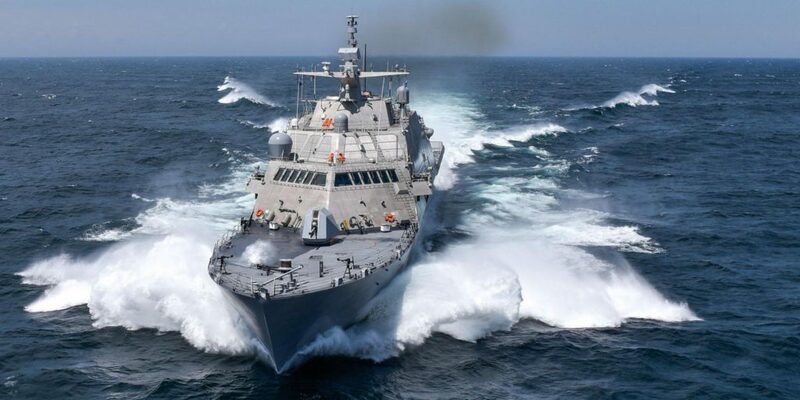 «Another thorough trial by the Board of Inspection and Survey, and another ship with improved scores and at a lower cost than her predecessor», said LCS Program Manager Captain Tom Anderson. «Detroit’s performance during acceptance trial is a testament to the hard work of the Marinette workforce. I look forward to placing the ship in the capable hands of her crew later this summer». Following delivery and commissioning in its namesake city of Detroit, LCS-7 will sail to California to be homeported in San Diego with sister ships USS Freedom (LCS-1), USS Fort Worth (LCS-3) and USS Milwaukee (LCS-5). Several more Freedom variants are under construction at Fincantieri Marinette Marine Corporation in Marinette, Wisconsin. Future USS Little Rock (LCS-9) is preparing for builder’s trials. Christened in January, future USS Sioux City (LCS-11) is currently conducting system testing in preparation for trials in 2017. Future USS Wichita (LCS-13) is preparing for launch in the fall. 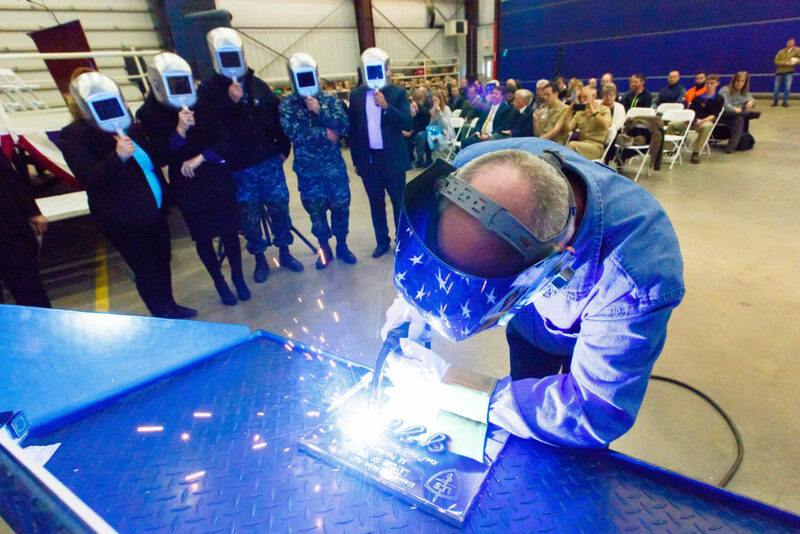 Meanwhile future USS Billings (LCS-15) laid her keel in November 2015 and sister ship future USS Indianapolis (LCS-17) started fabrication in August 2015 and laid her keel in July. Additional ships in the pre-production phase include future USS St. Louis (LCS-19), future USS Minneapolis/St. Paul (LCS-21), future USS Cooperstown (LCS-23) and to-be-named future LCS-25. Designed and built by two industry teams, the LCS class consists of the Freedom variant led by Lockheed Martin, and the Independence variant led by Austal USA for USS Jackson (LCS-6) and follow-on even-numbered hulls; General Dynamics Bath Iron Works led on USS Independence (LCS-2) and USS Coronado (LCS-4). Thirteen ships are under construction, purchased as part of the Navy’s innovative block-buy acquisition strategy. LCS is a modular, reconfigurable ship, with three types of mission packages including surface warfare, mine countermeasures, and anti-submarine warfare. The Program Executive Office for Littoral Combat Ships (PEO LCS) is responsible for delivering and sustaining littoral mission capabilities to the fleet.